In this meticulously documented call-to-action, David Spratt and Philip Sutton reveal extensive scientific evidence that the global warming crisis is far worse than official reports and national governments have indicated - and that we're almost at the point of no return. Serious climate-change impacts are already happening, more rapidly and at lower global temperature-increases than projected. These include large ice-sheet disintegration, significant sea-level rises of up to five metres this century, and devastating species loss. The Arctic will soon be free of summer sea-ice - a century ahead of projections by the Intergovernmental Panel on Climate Change projections - and the Greenland ice sheet is in imminent danger. "Climate Code Red is a superb, visionary blueprint for development in a new century which tackles the tough questions of how humanity can, in practice, rapidly secure a sustainable future. But it is also a work in progress, a draft strategy, which is primed to be shaped and developed by those who step up to meet the challenge we all now face." 7 July 2008: Climate Code Red - Reviews and Comments - "Having been involved with global warming climate change as a researcher in environmental health for 25 years, I can say that this is without question by far the best book to date on this issue -- the first book to have the integrity to say how the situation really is." 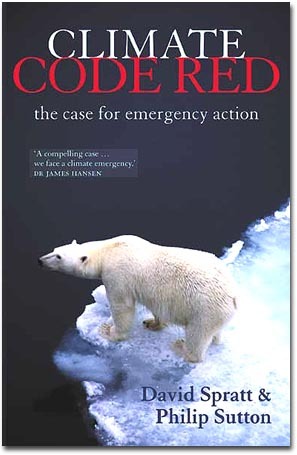 The book Climate Code Red was first published by the authors as a report for Friends of The Earth in February 2008, before being published (July 2008) as a paperback by Scribe Publications. David Spratt is a Melbourne businessman, climate-policy analyst, and co-founder of Carbon Equity, which advocates personal carbon allowances as the most fair and equitable means of rapidly reducing carbon emissions. He has extensive advocacy experience in the peace movement, and in developing community-campaign communication and marketing strategies. Philip Sutton is the convener of the Greenleap Strategic Institute, a non-profit environmental-strategy think tank and advisory organisation promoting the very rapid achievement of global and local ecological sustainability. He is also the founder and director of strategy for Green Innovations, and an occasional university lecturer on global warming science and strategies for sustainability. Philip has worked on a number of advisory and policy committees for Australian state and federal governments, was the architect of the Victorian Flora and Fauna Guarantee Act, and is a former president of the Australian and New Zealand Society for Ecological Economics (2001-2003). The tipping point for the loss of the Arctic sea-ice was around two decades ago, when temperatures were about 0.3°C lower than at present. Climate Code Red shows that further temperature increases of 2 degrees are effectively already in the system, and even a temperature cap of 2-2.4°C, which is proposed within the United Nations framework - and is far below what most governments are prepared to aim for - would take the planet's climate beyond the temperature range of the last million years. David Spratt and and Philip Sutton show that the unofficial, real projected speed of climate change- with temperature increases greater than 0.3°C per decade, and the consequent rapid shifting of climatic zones - will, if maintained, likely result in most ecosystems failing to adapt, causing the extinction of many species. The oceans will become more acidic, endangering much marine life. This means that the dangers we all face are already much greater than the headlines indicate. According to climate scientists such as James Hansen, it is no longer a case of how much more we can 'safely' emit, but whether we can quickly enough stop emissions and produce a deliberate cooling before the earth's climate system reaches a runaway trajectory that is beyond any hope of human restoration. David Spratt and Philip Sutton have provided a valuable and sobering contribution to the policy challenge of climate change at a pivotal moment, with their key insight that the expectation of failure has become the norm in climate policy. These imperatives are incompatible with 'politics as usual' and 'business as usual'. Climate Code Red argues that there is an urgent need for all of us to recognise that we face a sustainability emergency - which requires a clear break from the politics of failure-inducing compromise. Even scientifically moderate goals (such as reducing emissions by 25-40 per cent below 1990 levels by 2020) now require immoderate rates of technical and social change that are only achievable by shifting formally to an emergency footing. Ross Garnaut, the Rudd government's climate advisor, will this week deliver his interim report on climate emission reduction mechanisms, but the bigger policy questions will remain unanswered. The report will outline proposals for a carbon emissions trading scheme, perhaps better described as a cap-and-auction scheme, in which the government sets a declining cap on carbon emissions, with permits to pollute allocated by way of auction. Many of the broad themes have been publicly canvassed by Garnaut. As a free-marketeer, he has insisted that carbon trading be an even playing field, and resisted pressure from the fossil fuel lobby that they, the largest polluters, should be given preferential treatment and free permits. He has also put a strong case for a broad range of emissions, including transport, to be included so that the scheme does not pick winners between the various industry sectors responsible for large-scale carbon pollution. And in recognising that growing fossil fuel use is not a technological necessity but an economic choice, he has emphasised the need for a carbon price sufficient to effectively drive innovation and technological substitution, producing the economic restructuring necessary a build a low-carbon-pollution future. The Garnaut Review's deliberations have been frustrated by an incapacity of the government's computer models to even deal with the sort of emission reductions Garnaut thinks are necessary, an indication of the bureaucratic timewarp in which climate policy in Australia is trapped. And constrained by frustratingly narrow terms of reference, the review has been asked to recommend only an appropriate market-based means of reducing emissions, but not on the broader questions of substance. Garnaut knows that climate science is demanding emissions reduction much faster than the government appears willing to contemplate, noting "the diabolical nature of the policy challenge", and the "widespread view, based on the science, that the risks of 'dangerous' climate change and the risk of abrupt climate change, are already at unacceptably high levels at this point". In contrast to Garnaut's acute observations that the issue may be "too hard for rational policy-making in Australia" because "the vested interests surrounding it [are] too numerous and intense, the relevant time-frames too long", the government is caught in a policy fog, unable to find its way out of a bureaucratic framework that is now out of date. The Rudd government's current policy target of a 3-degree rise would destroy the Barrier Reef, the tropical rainforests, cause widespread desertification, a mass extinction, and a sea-level rise of perhaps 25 metres, amongst many impacts. Most worrying, the government seems unaware that this would be the consequence of a 3-degree target. There is little indication that governments understand what is now being said by the world's leading climate researchers: significant climate "tipping points" have already been crossed, and our world is already at the point of failing to cope. Sir John Holmes, the UN relief coordinator, warned that 12 of the 13 major relief operations in 2007 were climate related, and that this amounted to a climate-change "mega disaster". Take the Arctic, for example. The north pole has until recently been covered by an area of sea-ice in summer as large as Australia. Now it is disappearing fast, likely to be gone entirely within five years. Scientists' well-founded fear is that rapid heating as a consequence of the sea-ice loss will trigger the unstoppable melting of most or all of the Greenland ice sheet, an event which would raise sea levels by five to seven metres, in as little as a century. When he was a young man, Jay Zwally hauled coal for work. Now a NASA climate scientist, he told a gathering of fellow climate experts at the end of 2007: "The Arctic is often cited as the canary in the coalmine for climate warming ... and now as a sign of climate warming, the canary has died. It is time to start getting out of the coal mines." In essence, the climate problem is worse than even recent predictions, and we have even less time to act. Yet governments are sitting on the sidelines, seemingly in a daze as they grasp onto one solution and then another with insufficient commitment and little strategic understanding. A 3-degree rise, for example, will kick the climate into a new state and run away from the human capacity to live with it. Tens, perhaps hundreds, of millions of people will not survive. In Asia, 1.3 billion people whose homes lie in the basins of the great rivers that flow from the melting ice cap of the Hindu Kush-Himalayan ranges will be vulnerable because it is predicted those mountains will be glacier-free by 2050, or earlier. The damage inflicted by global warming will be worse than all the floods, fires, earthquakes and tsunamis we have witnessed in our lifetime, yet we are not taking the emergency action that is necessary. There is now a need to build political understanding that global warming and the tipping points for dangerous impacts that we have already crossed constitute a sustainability emergency. We must take urgent, large-scale global action that takes us beyond the politics of failure-inducing compromise. David Spratt is the co-author of Climate Code Red: the case for emergency action, published by Scribe in July. Below is a order & reservation form - please fill out all details. All your payment options and prices are listed on this page; these details are also repeated on the "thank-you" page that will open once you have sent the completed form below. Note: we ship as soon as your payment to us has been confirmed. Transfer your funds to our account at Bendigo Community Bank Fremantle, BSB Number 633-000. Account name: Project SafeCom Inc., account 115643900. NOTE: please contact us to confirm your direct transfer, quoting amount and date of your payment, and details of your order. IMPORTANT: When you're paying through a direct bank transfer into our account, please ensure that the first words in the description or comment section of the transaction are your surname, then your first name or city/town. This avoids confusion about the identity of the payment. 2. clarification that you'd like to receive Climate Code Red, and the number of copies you require. Project SafeCom has an online credit card transaction agreement with . Once you have completed the order form below on this page, click on the "Add to Basket" button on the page that will open to start your payment into our PayPal account, using your credit card. PayPal Inc. is a Certified Participant of the BBBOnLine® Privacy Program.